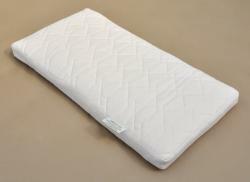 This beautiful, natural fibre bassinet mattress is the safest way to sleep your new baby. It has a medium/soft feel, has natural thermal qualities which will help your newborn to regulate his/her body temperature, and sleep through the night. At it's core is natural latex. 500gsm New Zealand eco wool (from the South Island) is then applied to either side of the latex core. This is all enclosed with an organic cotton and hemp cover. Hand stitched (no solvents or toxic glues used). Care instructions: Spot clean using a gentle detergent and leave to dry naturally. Why is pure wool a wonderful fibre for a mattress? Are naturally fire retardant – harder to ignite than most synthetic and cotton fibres used in equivalent products making it excellent for safe sleep. Uncoloured, unprocessed wool has also been known to provide wonderful relief for muscles, joints, and backbone and to stimulate circulation. Why is latex a wonderful fibre for a mattress? Natural rubber latex foam is produced from the rubber tree (Hevea Brazilensis). The trees are sustainably harvested and grown in plantations throughout Malaysia. This natural latex is biodegradable and contains no fillers or additives, compared to about 30% inert fillers contained in other foams. Latex is known for it’s therapeutic properties and its ability to provide orthopedic support. It naturally adjusts to the contours of your body, providing gentle support that maintains proper spinal alignment without restricting capillary blood flow. This reduces tossing and turning and allows a deeper, more restful sleep. It is durable, hypoallergenic, and has thermal qualities. It is porous and therefore breathable, keeping the body cool in summer and warm in winter. Bacteria, mildew, mold and bed bugs hate latex! Latex in a mattress can last for up to 20 years. A small percentage of people have an allergic reaction to natural latex which is caused by the natural proteins found in the Hevea Brazilensis tree. We advise you to test for possible allergy before considering natural latex mattresses. However, please note that we have never experienced any reaction to our mattresses as the latex in our products never actually comes into direct contact with skin. Why is it so important to get a natural mattress for my baby or child? One of the most important decisions you can make for the care, comfort and health of your baby is your choice in mattress. Babies and toddlers spend 10-14 hours a day sleeping and playing on a bassinette or cot mattress. A child’s every breath inhales air no more than six inches away from it. As such, for the first few years of a child’s life, the mattress is the single most prominent object in the child’s environment. Polyurethane foam, for example, is made from a base of petrochemicals combined with a staggering array of additional chemical ingredients used as stabilizers, catalysts, surfactants, and blowing agents. Each of these chemicals is associated with a host of environmental problems as well as numerous health hazards. Polyurethane foam is extremely flammable. To combat this hazard, toxic industrial fire retardants are added. The most common chemical fire retardant used to treat polyurethane foam has been pentaBDE, a toxin asociated with hyperactivity and neurobehavioural alterations. PentaBDE is not bound to the foam, so it leaches out into the surrounding air. It has recently been banned in Europe, and by the State of California as of 2006. Polyvinyl chloride (PVC), the surface material used in nearly all baby mattresses, is widely considered to be one of the most toxic and environmentally unfriendly plastics in use today. Phthalates, associated with asthma, reproductive effects, and cancer, make up 30% by weight of the PVC surface of a typical baby mattress. The FDA and Consumer Product Safety Commission have issued general warnings regarding the use of phthalates, yet the PVC surfaces of baby mattresses still contain phthalates. The PVC surface of a typical baby mattress is also often treated with toxic fire-retardant chemicals such as antimony, arsenicand phosphorous. Our natural cot and bassinet mattresses are free from all synthetic and unhealthy chemicals. The materials we use have been specially chosen because they allow good air circulation and provide the best comfort and support for a young child. A baby’s lungs, nervous and digestive systems are still developing and a natural mattress is the healthiest choice for young children who deserve the best start in life. Innature was established in 2006. Their entirely natural range includes designer slat beds, mattresses, pillows and sustainable furniture, and they custom make to your requirements. Innature has a reputation for exceptional quality – both in terms of the natural materials they make and their workmanship. Hundreds of families in New Zealand, Australia, Asia and the USA use Innature products every night to improve the quality of their sleep.